Finally, I got the hike I so desperately wanted. Don’t get me wrong I know that the trail-less peaks are part of the game and I save them for the not so perfect weather days but the past two hikes have been long and filled with slogging through the rain and mud. But I got a perfect weather day for an amazing hike. This was one of the few times that I didn’t use my guidebook. I had the pages with me but they had the trail in reverse so was more confusing compared to a write up I found online. You miss some details like a heads up on elevation gain but I’d rather go up the Saddleback cliffs than go down. But that’s just me. From the Garden parking lot it is the usual easy 3.5 miles in to John Brook Lodge. It’s mostly flat and you start getting integrated to the “woods” but like so many trails in the ADKs adds some mileage and time to your day. Water. No problem. Trees are always so helpful. 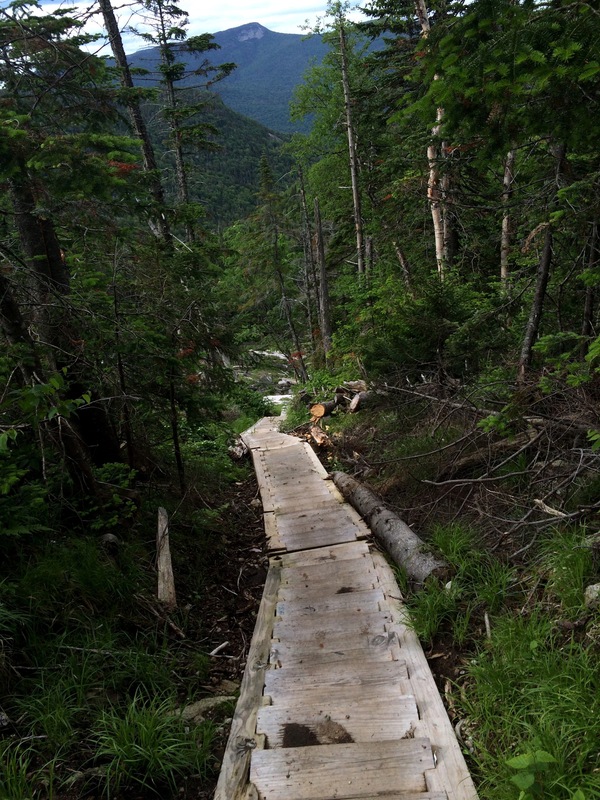 Once at the lodge you take the trail toward Marcy where you get your first increase in elevation but very moderate. There are a few brook crossings that required some reworking because of all the recent rain. 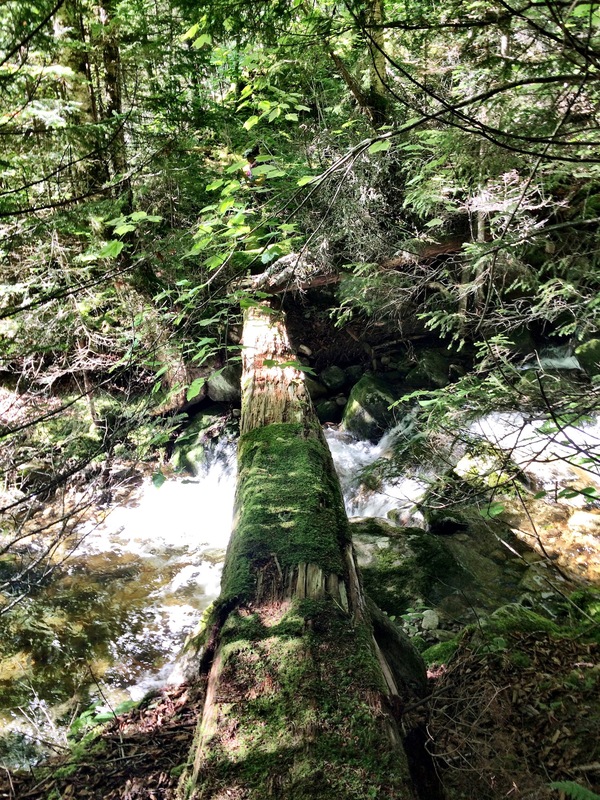 One I balanced across a fallen tree – but really I should have just walked through the water. Since the next crossing required getting my feet wet. I spent a good 20-30 min bushwhacking to find a better crossing than where the trail led me. One of the best pieces of advise I have ever gotten is to not automatically cross water where the trail leads you, especially in high water. Take your time and find the lowest water and best crossing. It is worth it. The water was running fast and deep and while I may have been able to jump rocks – it would have required a pretty serious distance jump and the possibility of falling off a rock into a cold, fast moving river sounds like fun – but I think I’ll save that for another day. Then at the Bushnell Falls junction taking the trail to Slant Rock and again is pretty easy – some rough footing, muddy, collapsed bridges over mud, but nothing like Panther and Couchs. I stopped seeing hikers at the point for the next four hours or so – until the Basin summit. At Slant Rock you’ll diverge from the Marcy trail to the Storey Cut Off. And now the fun begins. You climb and climb and climb. 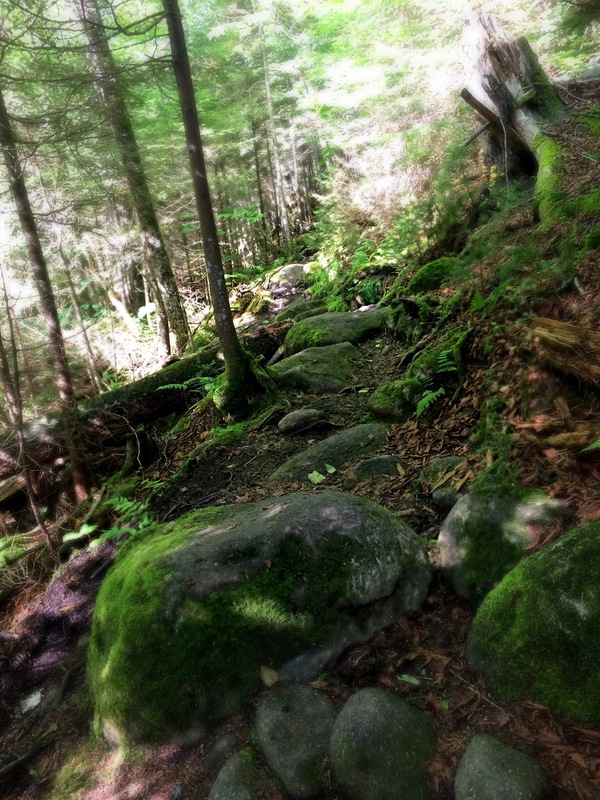 Some easy footing, some climbing over huge rocks, up fallen trees, over scrambles, through mud – you know the usual rough ADK wilderness trail. Then it levels and you get your first teaser of views for the day. You then descend and keep descending – down steep, wet scrambles. I hate that part. You’ve made all this elevation gain – with the sweat and tired muscles to prove it – and you are now giving it up to only have to hike up it again. I hate giving up elevation gain. Now at the Great Range Trail with Haystack only 1.1 miles away I was very tempted but knew that I just didn’t have the time (or speed) to include all three in a day hike. Headed off to Basin I was feeling behind schedule since the Storey Short Cut took longer than I thought. But in about 40 min I was at the summit of Basin. It wasn’t nearly as challenging as I thought. Yes, very steep and much over bare rock. One particularly long bouldering and scramble that just doesn’t end. They do give you a 20-foot latter in once tricky section. Which I was very thankful for given how wet it was. Then levels off a bit before the final scramble up the bare rock summit. Once you get to the split from the Storey Cut Off you’re getting pretty close. Last scramble before Basin Summit. At the summit I saw people for the first time since Bushnell Falls. But they were all doing it in the opposite direction Saddleback to Basin. After a nice break soaking in some pretty amazing views I was off to Saddleback and the epic cliffs that await. The descent to the col took a while and was steep with slippery scrambles. I took my sweet time and managed not to go sliding off anything. Yay for me. Once in the col you start climbing – very quickly in the trees but before too long you hit some slides a couple of scrambles and boom there they are: The Saddleback Cliffs. You make 100 feet in elevation gain in this rock climb. There are yellow blazes on the rock to help make your way up. For me there were three tricky parts. The first one I had a little trouble finding a good foothold that would get me high enough and close enough to the next section – but I’m not quite 5’4” so most peeps would have no problem. After throwing my bag up I was able to finagle it without the weight. Luckily the cliffs are broken up in sections with good resting ledges that allows you to catch your breath and tackle them in sections and is more manageable. The worst section was where you’re crossing horizontally from one ledge to the next. There is clearly a foothold to get you between the two that is ripple in the rock and not my favorite nor did it feel secure to me. The next ledge was just right there and I discovered if I kept my left foot on the first ledge, hugged the rock face and shimmied my right foot I could reach the next ledge and skip the foothold I didn’t like. I mean I was spread eagle against a rock wall but it worked. Not my most graceful moment – but I’m a hiker not a rock climber. Looking down afterward was a mistake since you can see that I would just slide for a while. The next several sections have crevasses or more pronounced holds that all doable. A couple of longer sections that when the wind was whipping you feel really exposed and have to force myself not to look down and to not think about missing a step. It was also so incredible thrilling. I could feel the adrenaline pumping, the wind whipping, totally exposed and so incredible rewarding to have completed something that was a mental push for me. That being said for rock climbers out there will laugh at it. But if you’re not used to that sort of thing it is pretty intimidating – and totally awesome. Just don’t look down or think about how you’re alone and no one will hear you scream. I quickly enjoyed Saddleback summit in solitude. It was beautiful, peaceful and complete perfection. Then down Orbed Trail, which was steep and intensely slippery. It’s more exposed rock than trail. It took forever and my knees hated me by the end. But a huge thank you to whomever put in some ladders toward the end. There also appears to have been some major trail damage from a storm (perhaps Irene). The work that has been done is visible but a big section is still sketchy compared to the rest of the trail. Once you reach the Orbed Lean-to the trail starts to get easier – both not as steep and more of a trail with footing vs. slippery open rock. Then a quick jaunt over to John Brooks Lodge – which I avoided going via the Interior Outpost since the water was raging and I had no business crossing it. And back to the Garden parking lot. The difference between a hike with a maintained, well marked trail and trail-less made me think of how sweet life is. Ditto hiking on a clear and beautiful day compared to mud and rain filled. All and all a great hike and exactly what my body and soul needed. The following day I enjoyed more great weather for a “down” day on my vacation playing at Lake Placid, reading by the Ausable River, picnic lunch and of course a stop at the Lake Placid Pub and Brewery. On deck and my last hike for my vacation: Emmons, Donaldson and Seward. The weeks rain had not been kind. So rude to fall right over a bridge. Bridges with guardrails seem fancy now. Water? No problem. Just use a decaying tree as a balance beam. Hmmm. I think those used to be bridges. Going down wet, slippery scrambles are my favorite! First section. Only about 10 more to go. Happy feet with fresh socks. 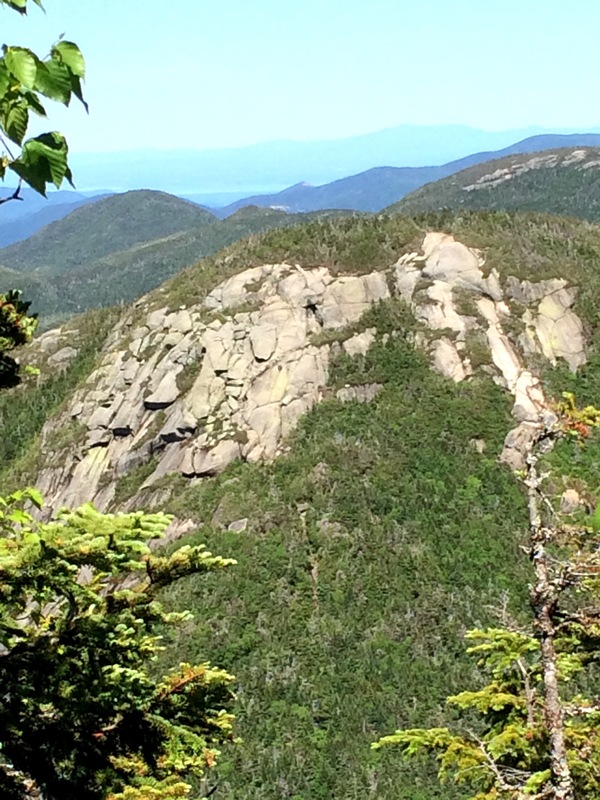 This entry was posted in Uncategorized and tagged Adirondack High Peaks, Adirondack Mountain Club, Adirondack Mountains, ADK46, Ausable River, Basin, Big Slide, Bushnell Falls, Great Range, Great Range Trail, Hiking, John Brooks Lodge, Keene New York, keene valley, Lake Placid, Lake Placid Pub and Brewery, New York, Orbed Trail, Saddleback, Saddleback Cliffs, Slant Rock, Slide, Storey Cut, Summit, Trail, vacation. Bookmark the permalink. I’m a 30 something living in the metropolis of Burlington, Vermont. 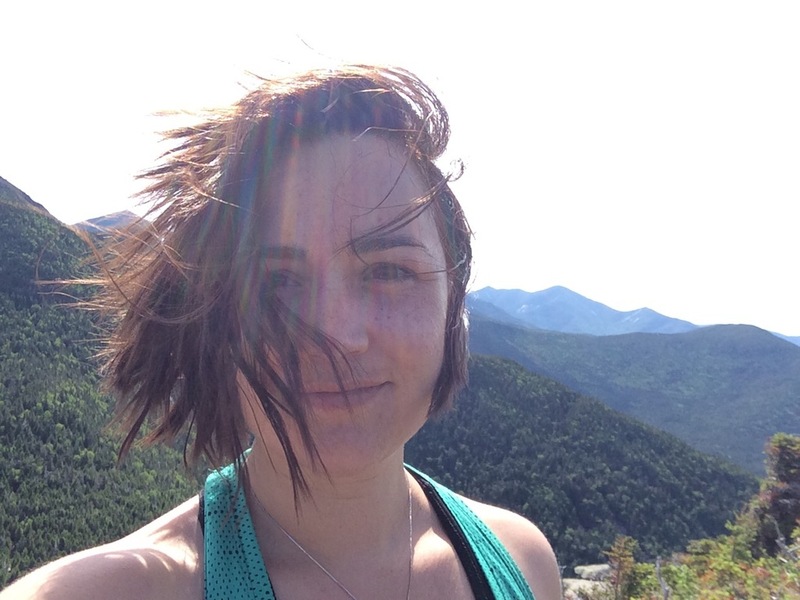 Grew up on edge of the Adirondack’s and set packing for six years to the beauty of Montana after high school, to care-free NYC for a couple of years (yeah I didn’t last long – I’m not a lifer) and now in Vermont and settling some roots down. 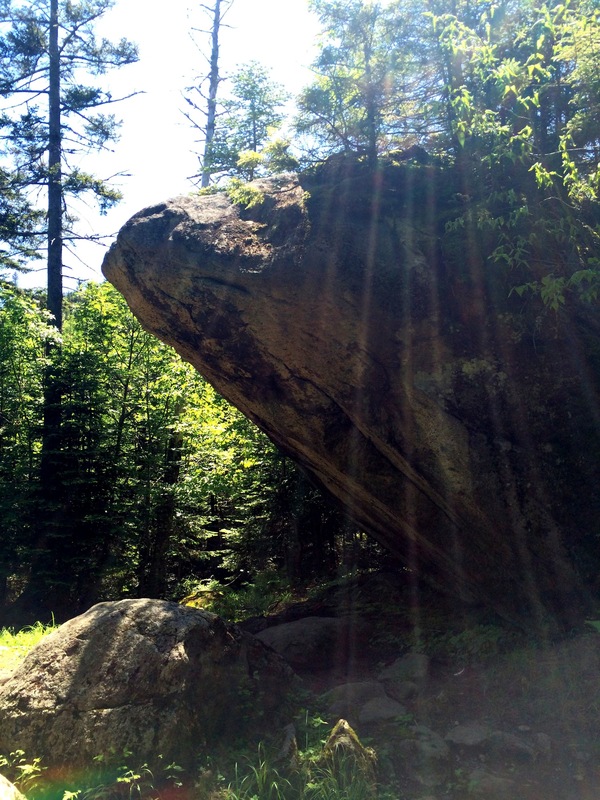 I’m just starting to hike the ADK High Peaks again and want to document that journey. Will I make it to hitting all 46 of them. Not sure. I’ll probably also post on other things. We’ll see how it goes.